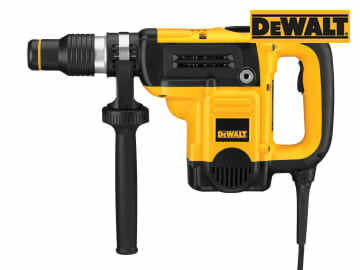 The DEWALT D25501K Compact 2 Mode SDS Max Combination Hammer Drill boasts an excellent power to weight ratio of 11 Joules of impact energy delivered by a 6.1kg hammer, rotation-stop for medium-light demolition applications and has a unique dust sealing protection to prevent even the finest dust ingress into the hammer mechanism delivering high durability and extended tool life. The hammer mechanism is optimised by reducing the number of components and by improving dampening to deliver maximum impact energy. The efficient mechanism delivers impact blows directly to the bit without losses through excessive vibration and rebound dampening reduces stress to the tool and the soft rubber grip handles improve user comfort lowering fatigue during extended use. The chain drive improves durability and increases efficiency together with an oil filled gearbox to ensure total component lubrication and superior heat dissipation with an ergonomic, compact and slim line design maximises control and offers easy access to confined spaces. Supplied with: 1 x Multi-Position Side Handle with Depth Stop, 1 x Heavy-Duty Carrying Case. Impact Rate: 2,740/bpm, 8 Joules. Capacity: Concrete 40mm, Breakthrough Bit: 55mm, Core Bit: 90mm. Length: 457mm, Height 245mm, Width 104mm. 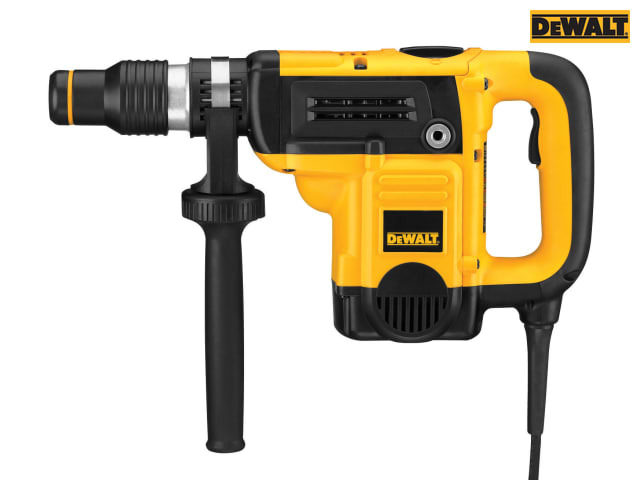 DEWALT D25501K SDS Max Combi Hammer 5kg 1100 Watt 240 Volt Version. 1 x Multi-Position Side Handle with Depth Stop.